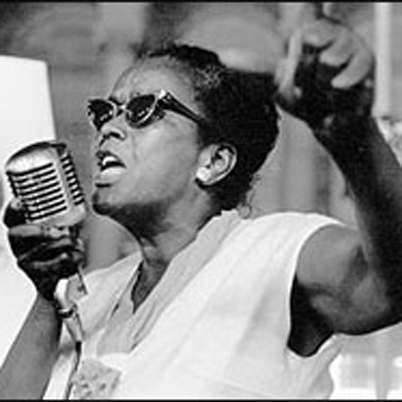 Ella Josephine Baker (1903 – 1986) made profound contributions to the Civil Rights movement as a lecturer, an organizer, and a fighter for social justice. She grew up in North Carolina, with a strong, influential mother who pushed her to continue education. After graduating from Shaw University in Raleigh, Baker moved to New York and became involved with the NAACP and community programs. She served in top organizational roles at the NAACP, and nurtured her passion for educating and helping others better their communities. In 1957, she moved to Atlanta, Georgia to help Dr. Martin Luther King, Jr. start the SCLC. King and Baker’s leadership styles infamously came into conflict; Baker felt that King was too authoritative and controlling, while Baker preferred to stay more behind-the-scenes and inspire others to become leaders. With this perspective, she founded the Student Non-Violent Coordinating Committee (SNCC) and worked tirelessly to help create a new generation of social activists. Her legacy lives on today through the Ella Baker Center, modern media depictions and biographical accounts.